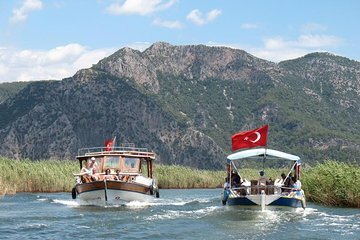 Observe las tortugas marinas y las tumbas antiguas a lo largo del pintoresco río Dalyan en un tour de un día completo desde la península de Bodrum que explora maravillas naturales, historia y la playa de Iztuzu. Navegará hasta los baños de barro natural y las piscinas termales del río Dalyan, disfrutará de un almuerzo buffet al borde del agua y visitará una fascinante necrópolis licia. Después de seguir el río hasta el mar Mediterráneo, pásate un rato en la arena de la hermosa playa de Iztuzu, donde crían las tortugas marinas de Turquía. Visita a los baños de barro natural y piscinas calientes. Ver una playa que es hábitat para las tortugas marinas. Incluye un abundante almuerzo buffet. Recogida y devolución en hoteles de la península de Bodrum. excellent trip - would recommend to all. picked up on time at 6am and transferred to comfortable air conditioned coach for the 3 hr journey from Bodrum. plenty of stops on the way including a breakfast stop where you could purchase a range of things for breakfast at a reasonable price. on then to the mud baths which was a really good experience - several different scented mud baths to try with no hassle or extra charge. After the baths we took a short boat journey to have lunch of mixed salad buffet and soup to start and then a main of fish or chicken with rice all included in price. After lunch we had a leisurely river cruise of about 1hour to the turtle bay beach - the guides were really good and kept up a interesting commentary on anything of interest along the way. 1.5hr free time at turtle beach to swim, walk etc before heading back up the river for our coach. we saw 3 turtles swimming in the bay playing with each other which made the day complete. A good trip well worth the money paid.